Why Read Nature Knows Best? Nature Knows Best is the first and only book on the benefits and importance of squatting in the world today. Written by computer scientist and researcher Jonathan Isbit, Nature Knows Best is the culmination of an eight-year research on the benefits of the natural squatting position and the serious danger posed by sitting toilets to human health. The astounding information within its pages is a must read for everyone - male or female, young or old, 'sitters' or 'squatters'. Nature Knows Best presents compelling evidence and explain, in simple and easy-to-understand language, why squatting is the best posture for bowel movements and sitting for bowel movements is hazardous in the long run. 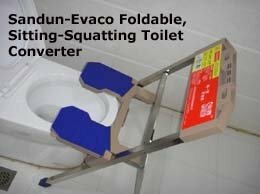 It reveals the fundamental flaw of sitting toilets, and exposes its link to the growing epidemic of colon, bladder and pelvic disorders and diseases. What You Will Find in Nature Knows Best? What Can Nature Knows Best Do For You? Nature Knows Best (printed book) measures 16 cm (6 inches) by 22 cm (8.5 inches), has 98 pages and is printed using quality 100 gsm wood-free paper (body text) and 250 gsm color card (cover). The eBook version (PDF file) has 60 pages (A4-size). Nature Knows Best contains never-before-published information that can help you avoid unnecessary pain and suffering. It will enable you to make the right choice regarding the toileting posture you should be using. Whatever your decision is, one thing is for sure: after reading Nature Knows Best, you will never look at sitting toilets the same way again.